Seth Sinovic ranks 10th in club history with 228 appearances across all competitions. Defender Seth Sinovic will spend another year with his hometown team. 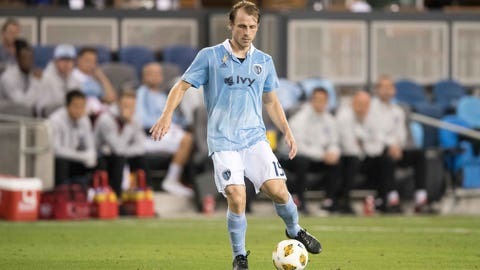 Sinovic, a 31-year-old native of Leawood, Kansas, has signed a new contract with Sporting Kansas City for the 2019 season. It will be his 10th Major League Soccer season since joining the league in 2010 as a second-round MLS SuperDraft selection, and his ninth with Sporting KC. Sinovic has helped Sporting KC win four major trophies — the Lamar Hunt U.S. Open Cup in 2012, 2015 and 2017 and the 2013 MLS Cup — since joining the club in 2011. Only Matt Besler and Graham Zusi have done the same. Sinovic ranks 10th in club history with 228 appearances across all competitions. Sporting KC’s Defender of the Year in 2014, Sinovic has contributed to 62 shutouts over the last eight regular seasons, and the club has a 0.92 goals-against average in his 179 regular-season starts. In 2018, Sinovic has started 21 of 25 MLS appearances as Western Conference-winning Sporting KC posted the third-lowest scoring defense in MLS. The left back has a 13-3-5 record as a starter this year, contributing to 10 clean sheets.